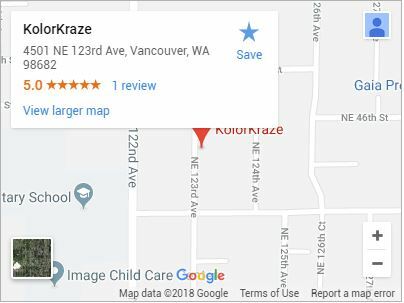 As a full service printing company located in Vancouver, Washington, KolorKraze can take your idea and see it through to production. We’ve been serving clients throughout the Northwest with cutting edge design for over ten years. When you choose KolorKraze, you can expect the highest quality and impeccable service and installation for all your product needs. Whether you are looking for a trade show banner or a car or boat wrap, we believe that each project is the pinnacle of our business relationship. We strive to produce the highest quality projects using the latest technology to keep your business on the cutting-edge. Got an idea? Let us know how we can help. Help your business get noticed with our full line of signage and banners. With so many options, we can make your booth the most popular at the show. We can custom build and install signage to your specifications and code. Make your business mobile. We print and install custom vinyl wraps. Add a sophisticated touch to advertising or signage on glass windows. From brochures to cards, we have a full selection of offset capabilities. Help your business get noticed with custom vinyl stickers in a variety of colors. Brighten up those blank walls with a custom mural for your home or business.